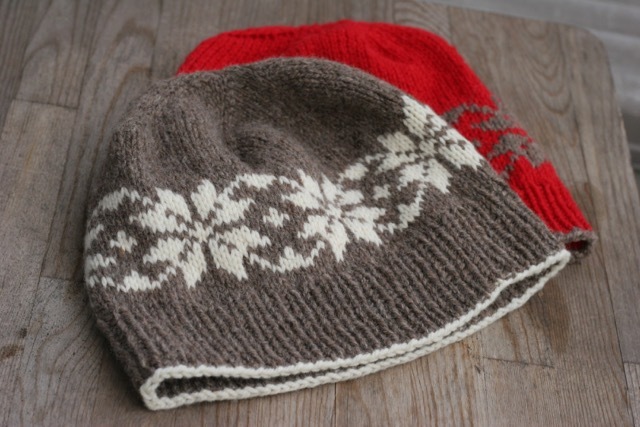 This is a pattern for a cute little winter hat with a bit of a Nordic flair thanks to the classic stranded pattern. 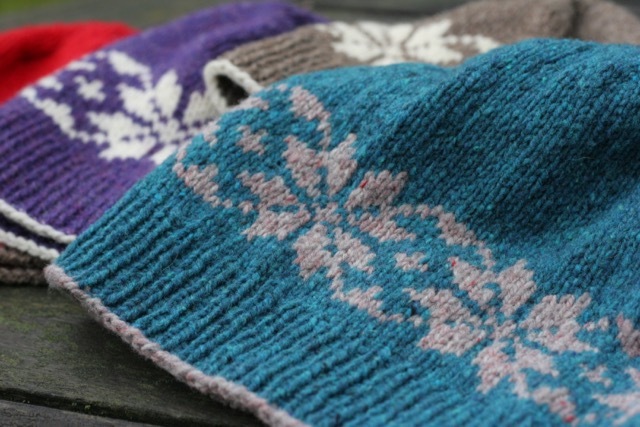 It knits up quickly in a worsted weight yarn and offers endless color options. It’s worked top-down which makes adjusting for personal taste quite easy. Add more rounds before the stranded pattern for a slouchier look or cut out some rounds if you want the hat to be more close fitting. Also depth of the ribbing is a matter of taste. I usually like a deeper ribbing for a snug fit, especially for the kids. A note on sizing: As the snow stars stranded pattern is based on a repeat of 18 sts there are limits to the sizing options on this one. I’ve worked samples in two sizes. The smaller one fits my 2 and a half year old boy with some room to grow. His head circumference is not quite 51 cm (19“). But it’s also fine for my 8 year old daughter with about 54 cm (21“) head circumference. The larger version (light brown) should fit an average sized adult head. 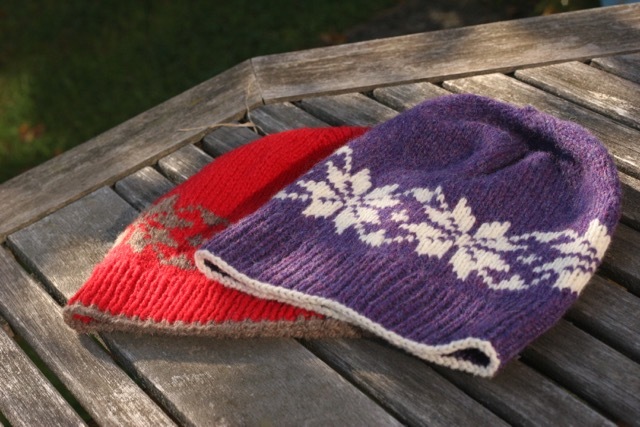 Some adjustments to size can be achieved by playing around with gauge and yarn weight. 4 to 4.5 mm needles for stockinette and stranded or needle size to obtain gauge. If your stranded knitting is usually on the tight side, just go up half a needle size for the stranded pattern. Cast on Cast on 6 sts/6 sts (I prefer using a circular cast-on) and distribute sts on either DPNs or a circular needle. Alternative crown shaping For a less scrunchy crown switch to increasing every second instead of every round after the initial 10 rounds. Straight part Work in stockinette stitch for at least 10 / 14 rounds (beanie) up to 20 / 24 rounds (slouchy). 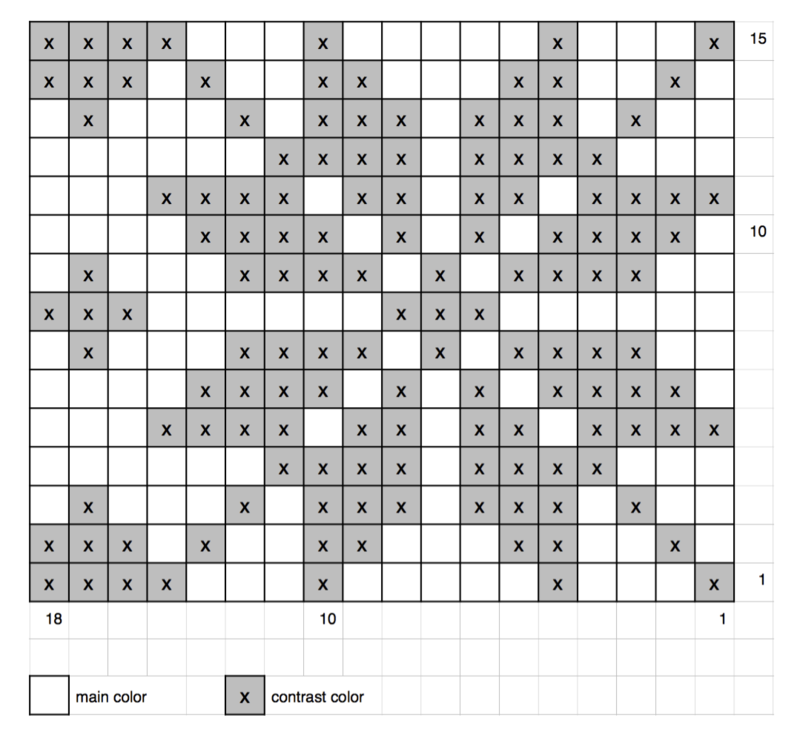 Stranded pattern Add contrast color and start working color chart – 5 / 6 times per round. After completing color chart work 3 more rounds of stockinette. 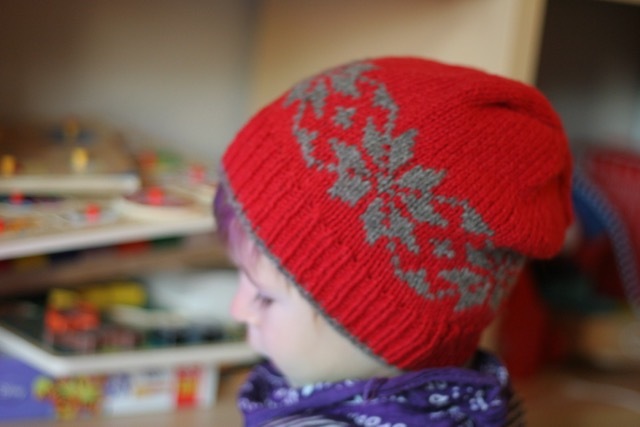 Decrease round For a snug hat band switch to smaller needle and decrease 9 / 10 sts evenly across round. Ribbing Work in 1×1 ribbing for at least 10 rounds or for as long as you prefer. Finishing Bind off in pattern (k1, p1) using contrast color. Sew in ends. Wash. Wear and enjoy!